Isn't it amazing what really gets you all fired up? I have spent several hours over the last few days picking out and printing up fun graphics from The Graphics Fairy to turn into cards to organize my lace yardage. Speaking of The Graphics Fairy, isn't it awesome how much more beautiful homes, studios, offices, and other spaces all over the world are because of Karen and her unbelievable files? There must be hundreds of thousands of projects created because she has made it so easy for us to access her treasure trove. But I digress...below is my almost completed project. Since things are shaping up in my studio, I've been a busy little bee making pretty containers and dressing up bottles and jars to hold buttons and the huge amount of floatsum that I seem to attract in the name of art. Lace is something I'm fairly passionate about and, while there is something magical about a huge heap of beautiful lace to dig through, the reality is, you can damage it or just plain not be able to find what you had in mind for a particular project with the piling and digging system of "organization". So, I began the process of finding cool graphics to make card that the lace could be wrapped around, making it easier to deal with and, naturally, PRETTIER to look at. I had no idea how much lace I had until I started trying to corral it. And this, mind you, is only the yardage, not the short little pieces or the very large pieces. I must say though, I think my goal has been accomplished: I wanted to have a visual display that not only allowed me easier access for projects, but that made me happy to look at it just as it sits. I printed on cardstock and then put pretty vintage wallpaper on the back (which I forgot to photograph-bad blogger, no biscuit! ), then edged with a little distress ink. If I were to start over, I'd put the cardstock onto thin cardboard and then add the wallpaper to make it a little more substantial, but it turned out okay as is. My houseful of boys just ignored my printing and pasting as long as food was tossed in their general direction on a fairly regular basis and the heaps of lace weren't in the footpath. I've given up trying to get high fives or raves from Mr. FL on this kind of stuff. He just isn't into it although I think he likes seeing me happy puttering and that counts for something. Besides, I've got you girls (and even a guy or two) who think this all makes perfect sense, right? On a related note, my shelves in my studio closet of dreams are installed and painted. I think I had to do the lace project just to occupy my mind and hands so I wouldn't rush the paint drying process and end up with lots of pretty stuff stuck to my un-cured shelves. On a very happy note for me, by the time I hit my next day off (day after tomorrow, but who's counting??? ), I should be able to start loading them up. I am SOOOOO excited about that. Do you think it's odd that I asked my husband after the last shelf was painted to join me in the closet for a glass of wine? No, of course you don't think it's odd, cause you get me, right? And if you don't, you'll humor me and keep it to yourself cause you guys are nice like that. We dragged a couple of chairs in and spent a little time talking before dinner that night and I was so happy and giddy over the closet (could have been the paint fumes I suppose...). Well, I'm going to get my little post posted and link up to a party or two. Why don't you come along? Digressing again, but is anyone else having to force themselves to get off of Pinterest and actually do something? Yikes, it's like virtual crack. Does that make me a crack ho??? Oh well, this too shall settle down, I'm sure. Oh my gosh! How beautiful!!! What a fabulous collection you have! They look just lovely together now with the cards. :) I love them! It's always so much fun visiting your blog! 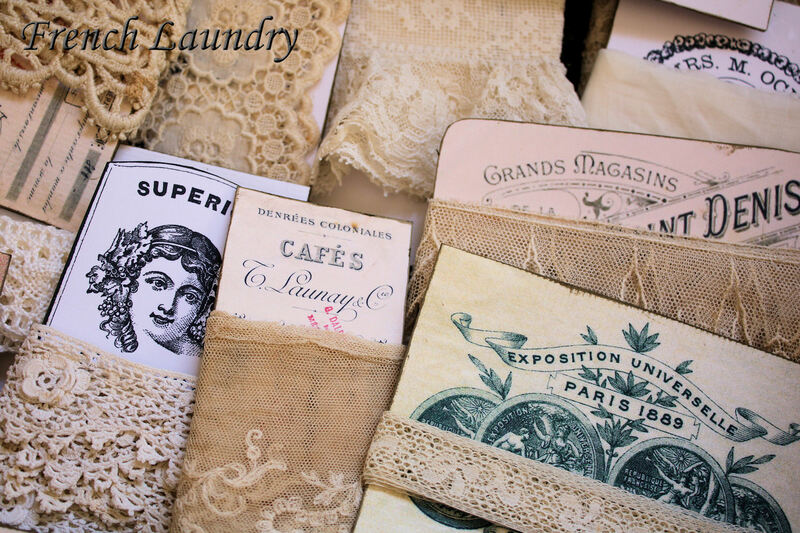 What a great idea for storing your lace in a pretty way. Your post made me laugh...my young girls like to check in with me on the blog scene or my crafting stuff but usually they say, "no more vintage, momma". I love how you said the boys were happy as long as you threw food their way. I love that your husband had some wine with you in the newly done closet, so cute! I love what you did with your lace--so smart! I want to find lace like that to have available for projects and I just don't know where to look. Yours is beautiful! OH my word..this is amazingly beautiful!!!!! Totally took my breath away, I bet I will see these stunning images all over Pinterest. I am headed over to this graphics fairy now...I have a thing for this kind of thing, so thank you for the intro! Truly beautiful! GORGEOUS!! Looks like a brocante to moi! it looks magnifique all together...sigh. My lace is wrapped around old book covers. this is soo much prettier! I am going to have to make some! And don't get me STARTED on Pinterest!! (FYI...I did a petite "segment" on the Pinterest Craze for our local news. you can find a link to the segment on my sidebar if you are interested in watching it! ) happy day! Hi Judy! What a fabulous idea! I think just looking at lace wrapped like that would inspire me to create!! Thank you for sharing!! What a great and beautiful idea! I thought I was doing well just to sort my lace into *baskets of different sizes of lace...yours is sooooo much prettier! And isn't it funny how a new project makes us sooo happy?! Have fun finishing up...can't wait to see it! Oh my goodness Judy...I have definitely gotten a real good dose of inspiration here. This is such a beautiful way to keep everything nice, neat, organized and pretty. I think I might just have to be a copy cat...Hee, hee, hee. I am so happy I found your beautiful and inspiring blog. Now off to look around some more. Have a wonderful day. I love this beautiful project! Little works of art just the way they are! the way you did this is so pretty too! 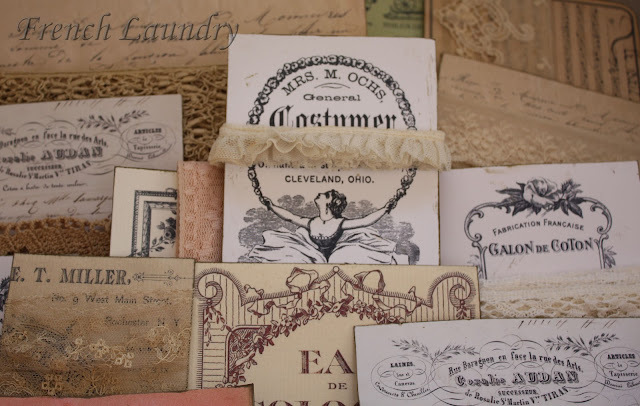 Prettiest and most romantic lace organization I've seen. Beautiful organizing, I'm all about that! I can only imagine your studio space! Judy I am in LOVE with these!!! I would love to sit in your closet and have wine with you!! 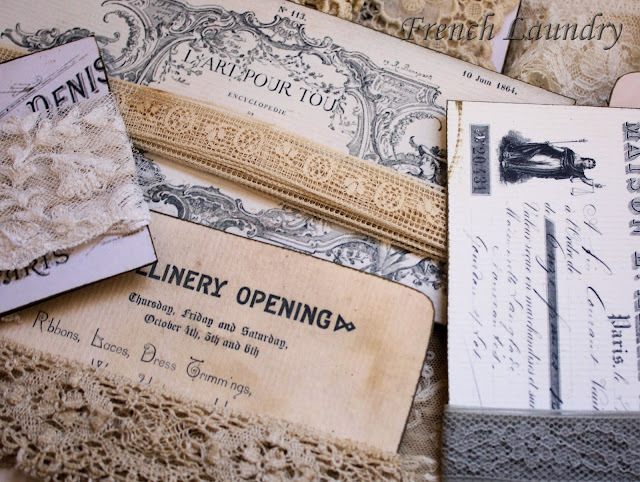 I would love to get my studio organized and do this with my lace that is all living in vintage suit cases and see through boxes. Oh you are funny,Judy! I love how you've corralled this impressive stash of lace - Graphics Fairy rocks. I would have joined you for wine in the closet, too. Can't wait to see the finished result! Thanks for sharing and happy setting up of your new shelves. the lace, the lace, i get so peaceful when i see lace. 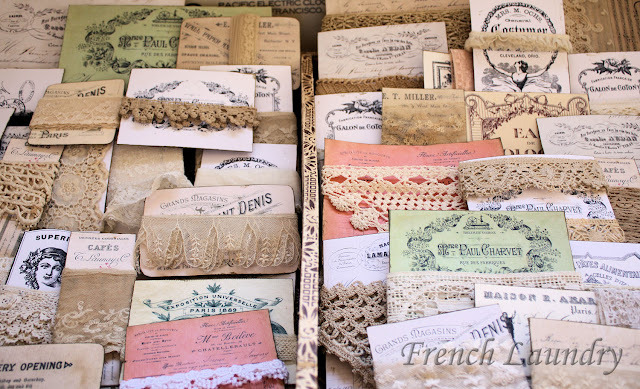 you did fab by organizing all this vintage lace. 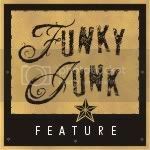 hope you take the time to check out our site. so nice to meet you! 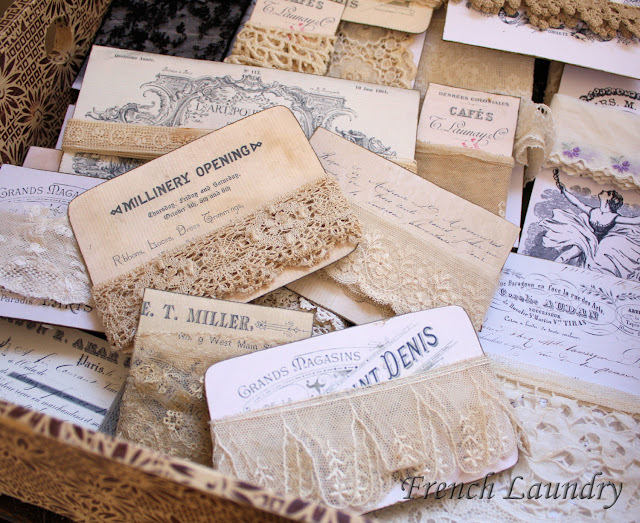 I am just swooning over these lace tags!!! My jaw just about dropped when I saw them. I have so many pieces from my 91 yr old mother-in-love, and these would be perfect for me. I wrote you an e-mail with some questions. thanks for sharing them with us. I am drooling here. Love what you have done with the vintage laces. It is so lovely and perfect. 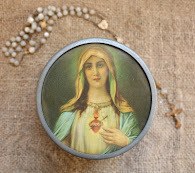 I am hosting a sweet little vintage petite jar swap for spring, just wondering if you would be interested in checking it out. Your work looks like my studio. Love love it! What a beautiful lace collection. I have been a fan of the graphics fairy for quite a while too. Love how you organized them. Your blog is simply wonderful. Your beautiful laces are breathtaking! Thank you for sharing your at Potpourri Friday! 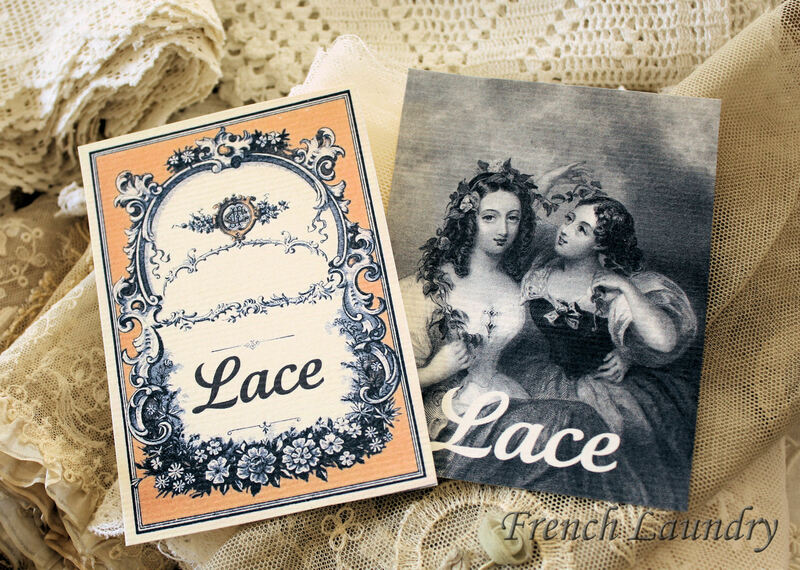 I love your cards of lace!1 Such a practical but more importantly beautiful way to store and display your laces. Don't you love that we have the access to such lovely downloads to enhance our spaces. All I can say is Wow! Wonderful! What a gorgeous idea for organizing your lace! Thank you for joining me at Home Sweet Home! This has made me smile and frown. I am smiling at your beautiful lace lovingly wrapped ever so carefully around each piece of pretty card. I however, am frowning at my beautiful collection of antique lace that has somehow sprung to life all on it's own and is wound itself into an awful mess in the pretty white wicker basket that I keep it in ! I can fee a project coming on ! Thanks for the inspiration ! You are featured today at Potpourri Friday at 2805! 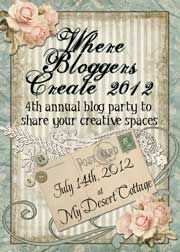 I am working on my creative closet too and this has been one of my projects that I have been wanting to do! Love all the graphics you found! Oh my gosh that all looks so beautiful!!! Love this idea. Can't wait to try it with my ribbon collection. I did this with my own meagre lace collection a few days ago. I just posted the results with a link back here. Thanks for the idea! Thank you for stopping by my blog. I love reading your comments. Musings from a lover of all things vintage and beautiful. I am a wife, mother, mosaic artist, microbiologist,antique dealer,and gypsy soul living in the beautiful state of Colorado. My life keeps me busy, but happy. 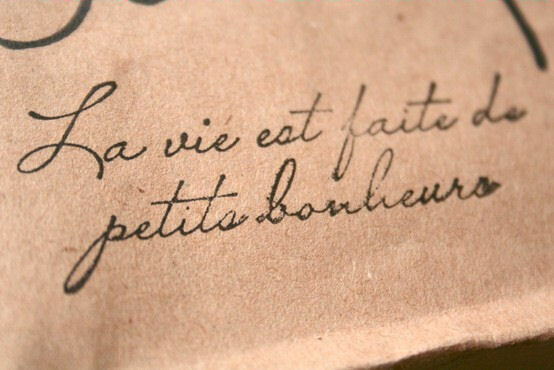 My sons entertain and inspire me with their energy and joie de vivre. Sometimes, being a middle aged mom, they wear me out, but I've never regretted one moment we've been together. In 2004, my son, who was 4 at the time, was diagnosed with acute lymphocytic leukemia. He had to undergo over 3 years of chemotherapy to get better. I'm happy to report that he is doing well, but the experience was life changing. I realized that "someday" is a luxury that not everyone will get to enjoy. So, with a new paradigm, I have embarked upon the artistic journey that I dreamed of doing SOMEDAY. I love making mosaic art, selling antiques, and dreaming of that beautiful, antique, French inspired space, with lots of glamour, grace, and, of course, a healthy dose of Legos on the floor along with a little Army man or two. This is, after all, reality! Live your dream, but keep it real. So what do you do with all that vintage wallpaper? 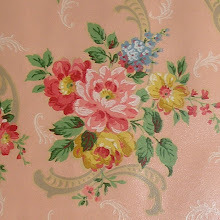 The Prettiest Pink Roses Vintage Wallpaper EVER!